For some reason, most people still consider donuts a breakfast food instead of a weird pile of sugar you're allowed to eat in the morning even though mom said treats were forbidden before breakfast. Because of this unexplainable loophole we're trying not to think too hard about, you're totally allowed to make these new Krispy Kreme donuts the first thing you chow down on in the morning. 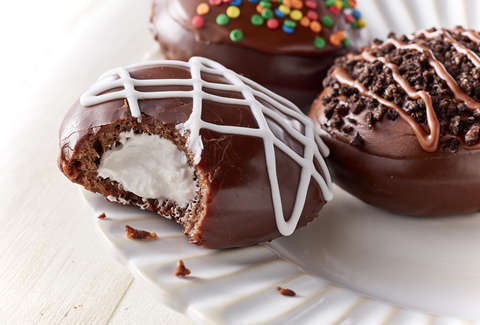 For the first time, Krispy Kreme is converting four of its classic filled donuts into a chocolate variation, which will be available starting January 14. They're calling it the Chocolate Glaze Collection, which makes it sound like something you'd buy on QVC. Only, this "Collection" is even better because it's filled with donuts. The "Collection" features the chain's Cake Batter, Raspberry Filled, Chocolate Iced Kreme Filled, and Oreo Cookies & Kreme donuts "choco-fied." 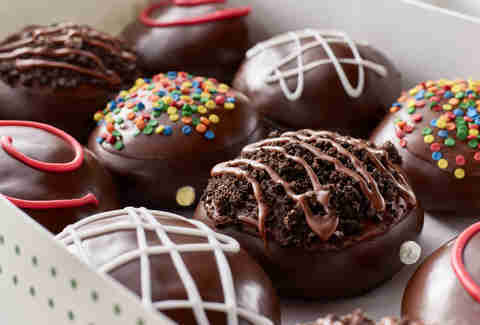 That means they're made with chocolate dough and covered in a chocolate glaze. The limited run will be available from January 14 through January 27 at participating locations in the U.S. and Canada. Additionally, over that same time frame, Krispy Kreme is offering a buy-one-get-one-free (BOGO) perk. If you join the Krispy Kreme Rewards program by downloading its app or signing up on its website, you can get a dozen Original Glazed donuts for free with the purchase of any other dozen at regular price. As long as we continue to believe that frosting and candy-covered cake is a breakfast food, it can remain true. Believe.